New Delhi: The Congress-led United Progressive Alliance government is pulling out all stops to ensure a timely transition to a goods and services tax (GST) and has accordingly proposed some confidence-building measures that will be debated at a special meeting of state finance ministers on 19 October. 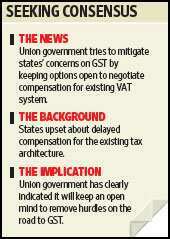 The Centre’s proposal was included in a letter sent by Union finance minister Pranab Mukherjee earlier this week. Significantly, the minister’s proposal came around the same time as the offer by the 13th Finance Commission on Monday to compensate state governments in case they suffer revenue losses in the transition period. GST is one of the terms of reference of the mission. Mukherjee is scheduled to chair a meeting of state finance ministers on 27 October to resolve outstanding issues and ensure GST’s implementation by the deadline of 1 April. GST, an attempt to stitch together a common market in India, will replace a tangled web of national, state and local taxes and is aimed as the culmination of a process of indirect tax reforms that began in 1991. The levy is ideally expected to help firms produce more efficiently and give consumers more clarity about the taxes they pay on goods and services. As a part of confidence-building measures, Mukherjee wrote to Asim Dasgupta, chairman of the empowered committee of state finance ministers and also the finance minister of West Bengal, that the Central government was willing to consider a compensation package for states suffering revenue losses under the existing value-added tax (VAT) regime even though they had not carried out the committed reforms. “However, our calculation shows that continuing last year’s compensation package without any change even in 2009-10, without the states imposing VAT on textile and sugar and increasing their basic VAT rate from 4% to 5%, will require the government of India to provide in the budget an additional amount of Rs14,000 crore for compensation to the states, which was not envisaged earlier," according to the letter, which was reviewed by Mint. His letter aimed to serve two purposes: explain the Centre’s position on compensation and also to engage in damage control after the state finance ministers took offence at the tone of a finance ministry letter on 17 September that queried why the states should be compensated when they had not undertaken their side of the bargain. According to a person familiar with the developments but who didn’t want to be identified, the empowered committee of state finance ministers at their meeting on 8 October, which had decided to come out with a discussion paper on the GST structure, had in fact sought an apology from the Union finance ministry. The same person said members were “furious" and threatened to walk out, even demanding dissolution of the committee. “The meeting could continue only after the officials" apologized, the same person said. Significantly, Mukherjee took note of this and said in his letter to Dasgupta that he had “advised his officials to be careful in future". The 17 September letter had conveyed to the states that they were not entitled for VAT compensation because they had neither raised the lower rate to 5% nor brought sugar and textiles into VAT. However, the Centre has some allies in its bid to increase the scope of VAT by including sugar and textiles. In a 29 September letter addressed to Dasgupta, Gujarat finance minister Saurabh Patel said: “It is important that immediate steps are taken to bring this sector (textiles) within the net of VAT." In addition to VAT compensation, the states are also upset that the Centre has not transferred compensation for a phased reduction of Central sales tax (CST) for the previous fiscal year. Currently, CST stands at 2%. Experts have welcomed the initiative. “The removal of any impediment will certainly go a long way in GST introduction," Prashant Deshpande, senior director at audit and consulting firm Deloitte, said.